A couple of weeks ago I got to spend a night at the Novotel International Airport Hotel. The hotel is located in shamshabad about 3 km from the International Airport. The hotel is 5 star and there are a lot of facilities available at the hotel to keep one engaged for a day. In this article I will review some of the facilities I did get to use in the airport. The room is very ordinary. 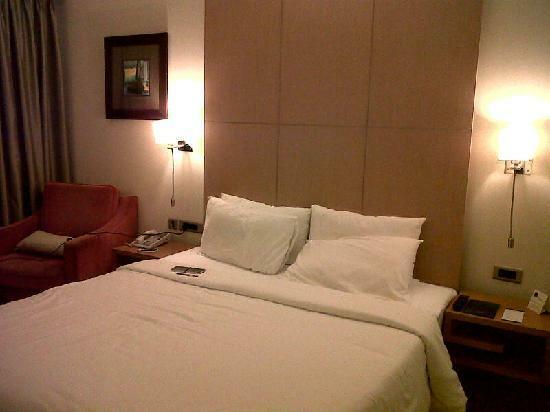 There are a lot of other 5 star hotels that have rooms that are much more spacious and luxurious. There are two views, the swimming pool view and the airport view but there is not much to view either way so it does not make much of a difference. The room has all the standard accessories and fittings one expects in a 5 star hotel. We did not get any night service where the bed is prepared to sleep in. Newspapers are only given on request. The television has a few foreign language channels other than the usual cable channels that one gets in India. I had all my meals at the square. That is lunch and dinner on the first day and breakfast the next morning. The lunch was regular 5 star restaurant quality food with some live counters one for Chinese, one for pizza and pasta and so on. The food was nothing to be overly excited about. In the night they had a more international spread with dishes from different countries including a sushi counter. The food again was average - didn't really go for seconds. The breakfast was very average - the Indian food was actually bad. Would I spend money to have food here again - not with the current quality. There are a lot of better places to eat in Hyderabad. Although around the hotel there are no places, one would have to go to the airport for fast food kind of fare. There is a free shuttle that one can take to the airport from the hotel. 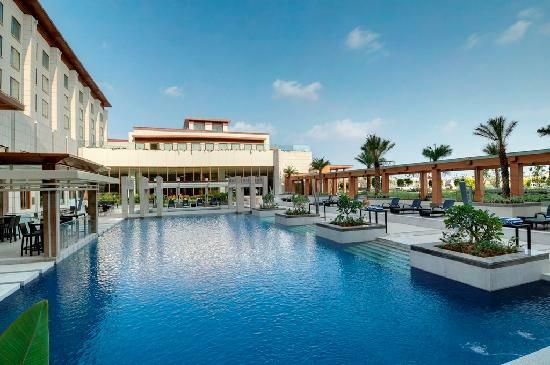 The swimming pool is within the confines of the hotel so it is surrounded on two sides by rooms and on one side by The Square. The depth of the entire pool is only 4 feet and there is a smaller kids pool of 2.5 feet. There is not much sunshine that hits the pool other than in the afternoon when the sun is overhead and being December the water was really cold even at noon. We saw the person adding a lot of chlorine powder into the pool in the morning. Only towels are available at the pool and there is no lifeguard. They were not strict on the dress code while getting into the water.The problem is also that the pool is in a very public place so there are a lot of watchful eyes all the time. So anyone who is public shy will not be comfortable swimming in this pool. The Gym is quite big and has a lot of equipment. There was no trainer available and also there were very few people using the gym. 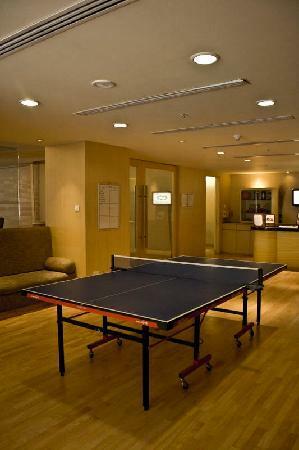 They have a nice table tennis table with quite a bit of space around the table to have a good game, the bats and balls are present with the spa front desk next to the table. They also have a sauna separate for men and women. 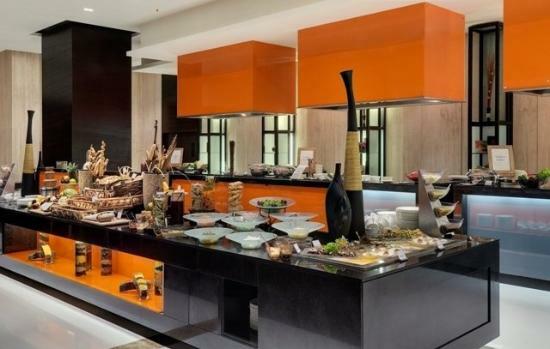 The other facilities at the hotel include another restaurant called Haldi that serves indian food and The Bar that you will see as soon as you enter the hotel. The 02 spa is quite extensive and have quite a few pricey treatments on offer. For sport, they also have a basketball court and a beach volleyball court. Generally the staff is a bit cold and they don't make you feel at home and comfortable. On the whole it was just an okay stay with okay food and some okay entertainment options. No real wow factor here.